Paradise found! Peaceful lake views, on this large lot, down at the end of a quiet cul-de-sac. Come see this open and airy 2BR+Den, 2BA, 1564 sq ft attached villa, located in the gated community of Bella Terra. 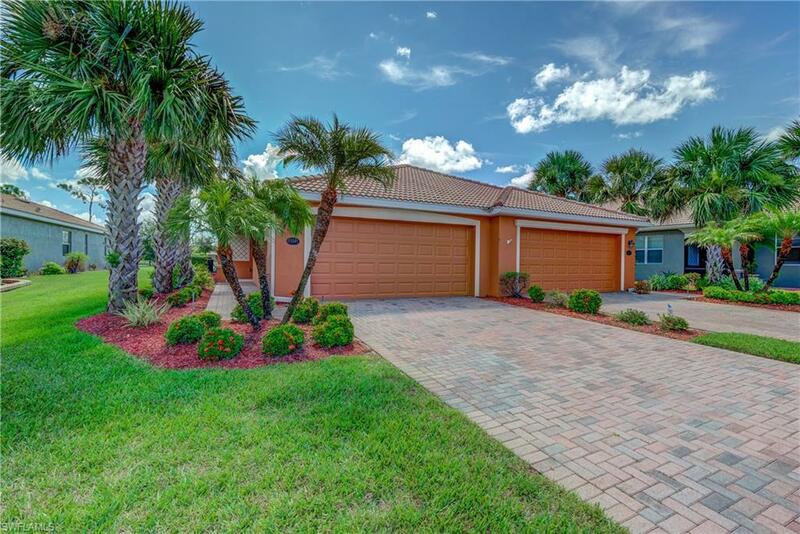 This home is in pristine condition with a wonderful open floor plan. Features include an upgraded kitchen with stainless steel appliances, and granite on counters, bar area and all bathroom vanities. Diagonal light tile in all the living areas with carpeted bedrooms. The generously sized living area offers direct access to a screened in lanai that faces east for great morning & mid day sun exposure. The light and bright master bedroom also provides you w/ lanai access and a private master bathroom with dual sinks, a large soaking tub, and a walk-in shower with frame less glass. Your guests will enjoy the private guest bedroom and bath in the split floor plan. Bella Terra offers a large list of amenities as well, including a clubhouse, community pool/spa, and tennis. This is a fantastic location close to Coconut Point Mall, FGCU, and the RSW Airport.